Classic games for Apple Watch. 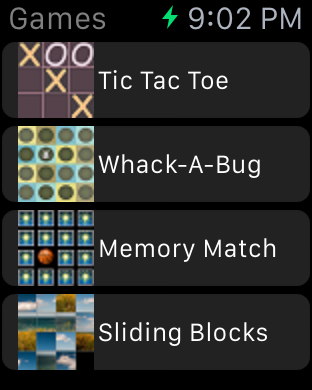 The games include Tic Tac Toe, Whack-A-Bug, Memory Match, and Sliding Blocks. This app is written using the Apple Swift language. The only reminder you'l ever need. An automatic reminder that displays contact icons to nudge a timely calls, messages, and emails using your phone's contact list. This app is written in objective-c and uses Contacts API, Core Data for local storage and local notification API. The only reminder you'l ever need. An automatic reminder that displays contact icons to nudge a timely calls, messages, and emails using your phone's contact list. This app follows Google Material Design and uses Support Library for same look and feel on all Android devices. It uses RecyclerView, SQLite for local storage and NotificationManager to create local notifications. The notifications are scheduled using AlarmManager.